One day a divine minstrel playing a golden harp and singing sweet songs appeared in the world during the early days of its existence. The strange minstrel was walking on his way towards Asgard the realm of Aesir Gods and Goddesses.His continuous singing of sweet songs and the sound of melodious music never heard before in the world could stir even the Gods and Goddesses in Asgard.All of them came towards 'Bifrost' the Rainbow Bridge which connected Asgard with Midgard inhabited by the human beings. A strange phenomenon took place just before the Aesir Gods and Goddesses reached the Rainbow Bridge. Shaking the earth a tremor occurred opening the earth before the strange minstrel and a very beautiful Maiden appeared with a Golden Casket in her hands. The manner the minstrel offered his hand to the lovely maiden just emerged from the earth revealed that both of them had made prior arrangements to meet each other in Asgard. 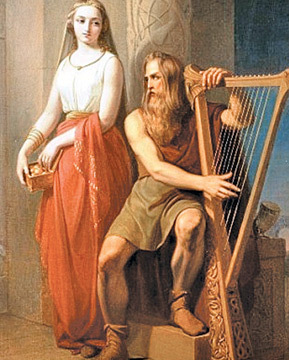 The divine minstrel and the maiden emerged from the earth carrying the Golden Casket in her hands could be visible engrossed in rapturous love.Both of them reached the entrance to the Rainbow Bridge hand in hand while the minstrel was singing melodious songs to the tune of the Golden Harp which he was playing. On reaching the Rainbow Bridge the Divine Minstrel introduced himself and the beautiful Maiden to the Gods and Goddesses gathered. He revealed the genealogy of his ancestry tracing back to Odin. The minstrel told the gods and goddesses that he was pleased to be in Asgard and came from Jotunheim the realm of giants and his mission was to sing and play for them in Asgard. "Welcome my son Bragi, Lord of Poesy and Sweet Music. Bragi the Lord of Poesy and Sweet Music introduced the Earth Goddess as 'Iduna the Beautiful' the Daughter of Ivaldi the Earth Dwarf. God Odin asked what Iduna was carrying in her Golden Basket. Responding to Odin, Iduna said in a very soft voice that she had brought the 'Apples of Youth', having powers to make the Gods and Goddesses young and strong forever. 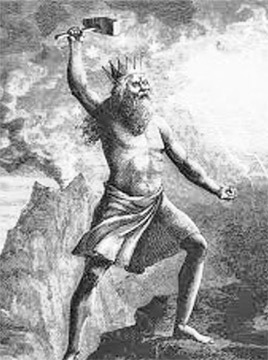 Odin was so happy and said that even the Gods and Goddesses could become old and referring to the impending war against Giants, strength was indispensable for the Gods in Asgard and thanked Iduna immensely for reaching Asgard at an opportune moment. The wedding feast of Iduna and Bragi took place as arranged in Asgard with the participation of all the Gods and Godesses in Asgard. At the end of the wedding feast as a gesture of friendship, Iduna walked around the banquet hall and gave each and every God and Goddess a Golden Apple and when they started to eat the Apples they felt that they were getting younger and stronger than before. Since their wedding, both Iduna and Bragi stayed in Asgard with the blessings of Odin. The number of Golden Apples always remained the same in her Golden Casket. Induna never left her garden where the Apple tree grew and day and night Induna listened to the stories never having an end narrated by her husband Bragi. Giants in Jotuheim were plotting how to steal Iduna's Apples but proved to be extremely difficult till Loki's intervention. All Father Odin was in the habit of making surprise visits in disguise to Midgard the land of the humans to gather firsthand information on their activities. One day Odin and his brother Honi left for Midgard in disguise on their usual fact finding mission. Both of them were travelling far and wide and at last they reached a desolate region in close proximity to Jotunheim. The region where Odin and Honir arrived was so remote and neither grass nor animals were to be seen. When they were wandering through the wooded vales, glens and mountains they came across a young man having mischievous eyes. To both Odin's and Honir's utter shock the stranger addressed them by name while flashing back to the past incidents, tracing even the relationships to Odin. The stranger revealed that he was Loki and said he was having Giant blood in him. Loki appealed to Odin and Honir to allow him to join in their wanderings and provide him a chance to prove his skills and whether he was suitable to be with Aesir In Asgard. Besides Loki volunteered to assist Gods in their war against the Giants. Finally Loki joined Odin and Honir and Loki soon found an opportunity to prove his skills. On their wanderings, Odin, Honir and Loki had to pass through a long stretch of wasteland without finding anything to eat. After travelling a long distance they saw a herd of oxen grazing at a distance and they killed one of the oxen and Loki made a fire to fry the ox. Loki found frying the meat proved to be an impossible task however much logs were added to the fire. Meat continued to be raw and at last Loki became furious . Even Odin had suspicions on Loki whether he was instrumental in preventing the frying of the meat . Suddenly a shrill cry from a tree just over his head said, "However much you try you will never be able to cook the meat without my help." Three of them looked up to see the largest Eagle they had ever seen resting on a branch of the tree. The eagle agreed to help cook the meat on condition that they should allow it to eat as much as he preferred . The Eagle came down from the tree and consumed everything of the fried ox without leaving a morsel of meat for three of them. Loki got furious and hit the Eagle with a stick which got entangled with the feathers of the flying Eagle and Loki himself stuck to the other end and the Eagle flew through sharp edged rocks, jungles and thorny bushes causing great pains to Loki. Loki pleaded the Eagle to release him and agreed to offer anything he wished. Eagle responded : " If you bring Iduna and her Basket of Golden Apples out of Asgard , I'll take you back to your friends and restore the fried ox as the dinner for three of you." At first Loki refused to undertake such an impossible task of bringing Iduna and her Golden Apples giving reasons that he was not an Aesir and he would not be allowed to enter Asgard . Revealing his real self the Eagle said he was 'Thiassi the Storm Giant'. The frightened Loki agreed to bring Iduna and her Golden Apples before Thiassi the Storm Giant. Thiassi as agreed carried Loki back to Odin and Honir still waiting by the fire. Loki concealed everything, his agreement between Giant Thiassi to bring Iduna and her Golden Apples out of Asgard. Unsuspecting Odin offered a place to Loki to live in Midgard closer to Bifrost the Rainbow Bridge. Loki who could not give up the inborn traits of a Giant resorted to his first plot against the wishes of the Aesir by promising Thiassi the Storm Giant to bring Iduna and her Casket of Golden Apples before him. Loki while living in Midgard with the blessings of Odin never forgot the promise he made to Thiassi. He was thinking how to entice Iduna to come out herself from Asgard with her Basket of Golden Apples. One day Iduna and her husband Bragi were seen enjoying the beauty of Midgard. Loki was awaiting for a chance to meet Iduna alone and as expected Bragi left her for a moment. Loki, the conman hit upon a plan to cheat Iduna. He told Iduna that better Apples could be found in a tree growing in a jungle nearby. Loki asked Iduna to pay a visit to the jungle with her casket of Golden Apples to do a comparison of both kinds of Apples. Iduna promised to visit the forest found in Midgard only the following day with her Golden Apples.